R1200RS 1170cc 2015 - 2016. R1200RT 1170cc 2015 - 2016. R1200R 1170cc 2015 - 2016. R1200GS 1170cc 2013 - 2016. R1200GS Adv 1170cc 2013 - 2016. R1200 dohc liquid-cooled Twins. Complete coverage for your BMW R1200 dohc liquid-cooled Twins 2013 to 2016. With a Haynes Manual, you can do it yourself, from simple maintenance to full repairs. Every Manual is based on a complete stripdown of the car. 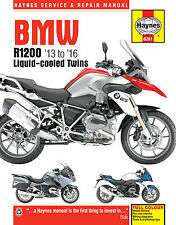 R1200 dohc liquid-cooled Twins. Complete coverage for your BMW R1200 dohc liquid-cooled Twins (2013 - 2016). Book Number: 6281. With a Haynes Manual, you can do it yourself, from simple maintenance to full repairs. Here we have for saleGENUINE 2016 BMW R NINE T SCRAMBLER OWNERS MANUAL in good, usable condition. USED, 3 YEARS OLD BOOK. If you are unhappy for any reason we can help. Ireland and the. 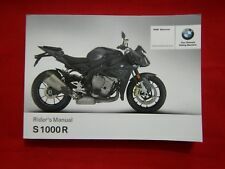 Here we have for saleGENUINE 2016 BMW S 1000 R OWNERS MANUAL in good, usable condition. USED, 3 YEARS OLD BOOK. If you are unhappy for any reason we can help. Ireland and the. Genuine BMW motorcycle rider's manual as would have been supplied with the motorcycle when first sold. It is in very good condition almost as new. Genuine BMW R1200 GSA Owners Handbook, service manual. Please note there are two in the listing, one being for bikes up to 2016 - 2017 the other being for 2018. Please let me know which one you require. Both new and unused. 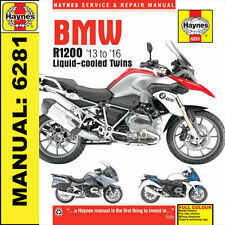 Haynes Manual 6281 BMW R1200 DOHC LIQUID-COOLED TWINS 13-16 Haynes Manual 6281 BMW R1200 DOHC LIQUID-COOLED TWINS 13-16.